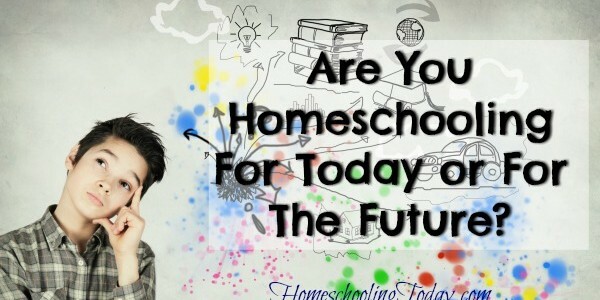 Homeschooling Today magazine | Are You Homeschooling For Today or For The Future? 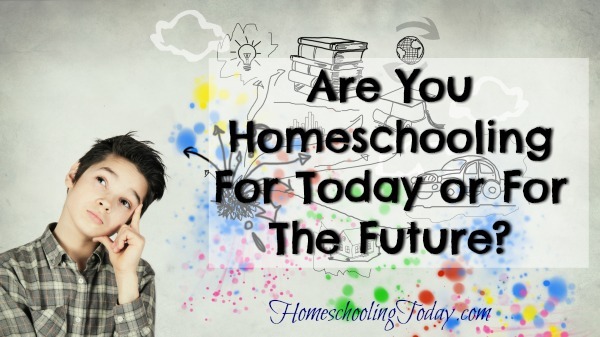 Homeschooling little ones can sometimes get you mired down in the minutiae of the day-to-day. Trying to keep up with the never-ending laundry (both clean and dirty! ), picking up toys after playtime (especially the ones with wheels on them! ), dealing with discipline issues and handling everything involved in feeding your crew…well, those activities alone are enough to handle some days! And on those days, adding to it all that’s involved in educating your kiddos at home ~ no matter how deeply committed you are ~ you may feel like you’re one step away from “the edge.” If you find yourself there today, this message is for you. I wish someone had come alongside me when my 2 oldest were young and I struggled with this. Or even, many years later, when they were in elementary school and I found myself once again with 3 pre-schoolers. It was during those times when I needed to know: there was a bigger picture to homeschooling; a short list of areas to focus on, and a proper place where book-learning fit in to the picture. I didn’t focus on passing on our beliefs and faith-foundations when our 2 oldest were young. Yes, we did go to church, and talk about faith at home, but it was really piecemeal; nothing intentional. And on days that I ‘lost it’, I didn’t even think to use my less-than-stellar moments as teaching opportunities. With our younger set, I was much more intentional with making focused Bible study a part of our daily routine, and incorporating a discipleship mindset with them. No matter what your faith, it is really important to teach your children about life within a framework (also known as a worldview). They’re your children. Teach them yours. This is oh-so-important! Character is one of those gifts that keeps on giving. And teaching this one starts when your child is in diapers. So don’t feel like those temper tantrums or childish mess-ups are a drain or waste of your time! Character training happens when you discipline, and when you model it in your own life. A child who learns traits such as having a good attitude, being persistent, setting priorities, developing self-control, focus, healthy habits, kindness, forgiveness, etc. will have a much easier time learning anything else in the future. Even though this generation is touted by millennials as the best-connected…just spend some time people-watching at a restaurant or play ground or house party. I am amazed at the lack of people skills displayed these days. Because of this, we are in danger of raising future generations that may be irreparably self-centered, shallow and, well, clueless. A sincere and committed friend, brother or sister with healthy interpersonal skills has the potential to make a huge impact on those around him or her. Help your child become that person. I always considered chores as a Life Skills class when the kids were younger. Seriously, chores are also wonderful opportunities to develop character training, as well as introduce the concept of stewardship. One of our goals as parents should be to teach our children how to be good stewards of the blessings they have in their lives. But this does not only related to physical property. Taking hold of and being responsible for their own education and learning as they grow reflects good stewardship of the gifts and talents with which God has blessed them. Yes, you might have noticed that this is the last thing in the list, and it’s in this spot for a reason. There are a myriad of curricula and tools you can use to teach subjects…but without building on the foundation of the previous concepts, well, our children are at a distinct disadvantage, and our educational efforts will most likely fall short. Remember the frustration I described earlier with laundry, cleaning up, discipline and meal prep? Now look at those activities in light of the bigger picture! No longer are they drudgery and ordeal. They’re opportunities to teach your kids life skills, to instill and display character traits, to teach concepts such as stewardship and teamwork, and more. When these enterprises are established, the emotional peace inside you and your kids and the practical order in your home will pave the way to an environment that is conducive to learning…in every way, at every time. You’ll be setting your children on a journey of lifelong education, and raising children who will grow into caring and capable adults, providing valuable contributions to society. That’s homeschooling for the future! Pat Fenner has been homeschooling her 5 children for 20 years, learning and changing her methods quite a bit during that time. Preparing for a soon-to-be empty nest, she shares what she’s learned and encourages others in the journey over at PatAndCandy.com. Join them over a cup of coffee and sign up to get useful and creative parenting and homeschooling “members-only” helps. I admire home school moms so much! As you mentioned above, there is so much already in the day to day and then you add all the course work too! Keep up the great work! You are making a difference! Thanks for sharing with us at Faith Filled Parenting! All moms have a huge job and keeping things in perspective can be hard! Great reminders. 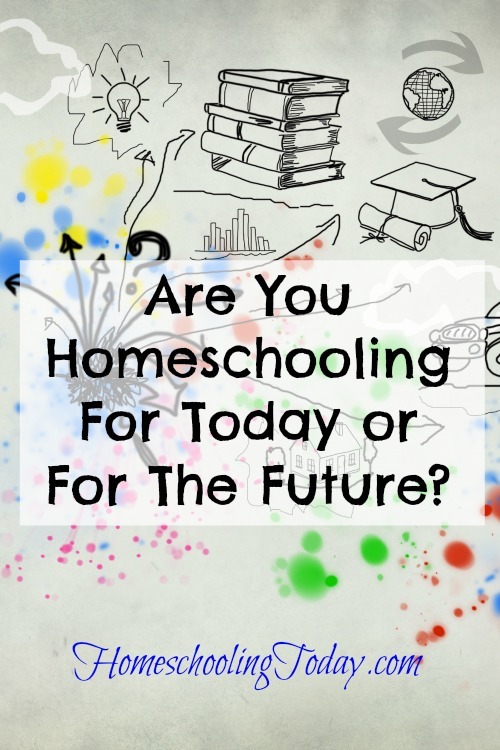 Found you on HomeschoolingNook link-up.